Join The Music City Group! WE ARE CURRENTLY SEEKING FULL TIME BUYER AGENTS TO JOIN OUR TEAM! We are a top performing real estate team in the Nashville area. We work together daily to achieve an extraordinary income while providing extraordinary service to our real estate clients. Joining our team allows you to plug into our systems, tools, and marketing without having to incur any of the costs. We will handle everything. We will also teach you how to use our systems to organize and build your business. We will continually work together to make sure you are the best agent you can be and your clients receive the representation they deserve. Do you want to make an above average income? Do you want to focus on selling real estate and helping clients? Do you want your past clients and sphere of influence to receive 'touches" every month reminding them you are in real estate without you having to lift a finger? This isn't for just anyone. You must want to work! But, you must also be cool. You must enjoy a healthy and fun atmosphere. We enjoy working together and are looking for the perfect addition. Not just any addition. New agents welcome. We will teach what you need to know. We will also work to get you paid in the shortest amount of time possible. Benchmark Realty, LLC is the fastest growing brokerage in Middle TN. Home to 856+ real estate agents and many of the top performing agents in the area. Ranked on the INC5000 list of fastest growing companies in America for the past three years. Ranked #87 on the RealTrends list of Top 500 US Brokerages for 2016. 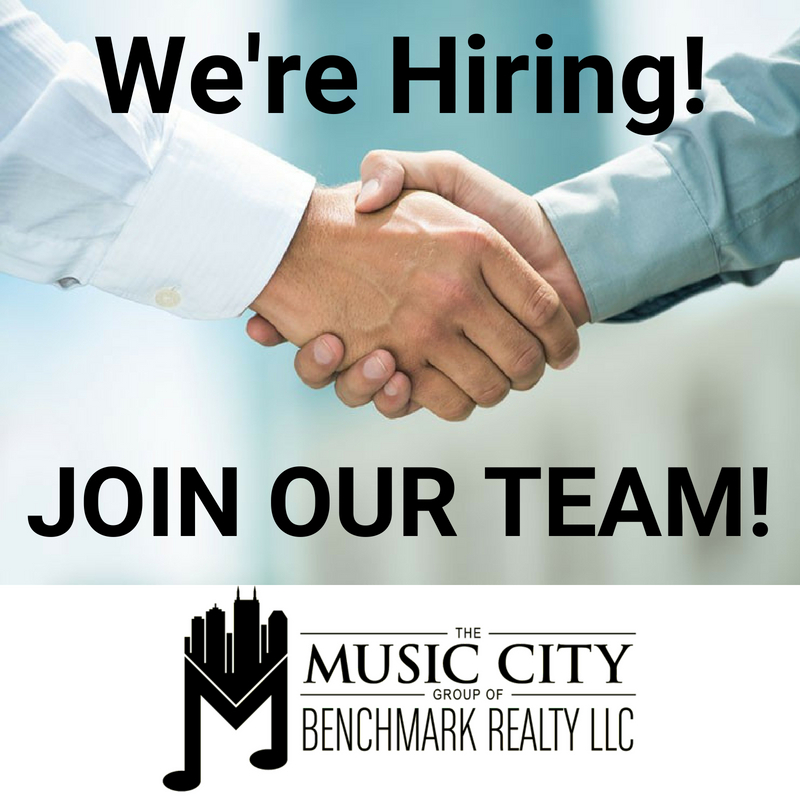 Benchmark's brokerage power paired with The Music City Group's constant lead flow, training, systems and full time team support are a recipe to make an amazing income in real estate. If you would like to learn more please reach out to us at [email protected] or fill out the contact form below. We look forward to hearing from you!.